From the launch of the Kissing Tree Golf Club to the grand opening of Independence Hall, 2018 was a big year for us here at Kissing Tree. The good news? 2019 is looking even bigger and better with signature events, unlimited activities and amenity milestones. Here’s a sneak peek into a very busy year ahead! The music is hot and the beer is cold! We’re thrilled to bring back our Live Music Series this June in the biergarten. The weekly event will be open to the public, so grab your honey or your friends, and get ready to boogie down on the dance floor. Join us for our First Annual Cinco De Mayo Celebration in the biergarten! We’ll have live music from the Texas State Mariachi Band, signature drinks and more. We take our holidays pretty seriously here at KT and Independence Day is no different! Celebrate our great nation’s freedom with a golf cart parade, festive activities, fireworks, a live band and a special ceremony. The demo kitchen is officially up and running with Kissing Tree’s very own award-winning Chef Kirk Doyle. Every Friday, Chef Kirk will cook up tasty Texas BBQ and Southern fixin’s for both residents and visitors alike. Don’t forget to wash it down with a cold beer at the KT bar. In an effort to help our residents design their dream home, we’re expanding the current Design Center. Stay tuned for more details on timing and location. With over 400 residents already calling Kissing Tree home, we can’t wait to welcome more folks into the community. While we can’t share all the details quite yet, we can tell you to get ready for even more neighbors this year! Construction for our state-of-the-art fitness facility and indoor/outdoor pool will start this spring. Get ready to celebrate the construction milestones with groundbreakings, parties and more, with grand opening plans in 2020. 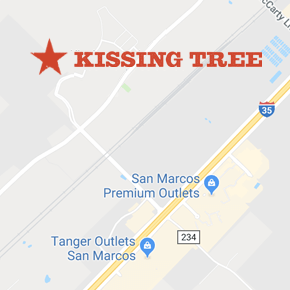 Pickleball is the fastest growing sport in the country, and Kissing Tree is home to eight of the most beautiful pickleball courts in Texas! Whether you’re a spectator or a player, the SSIPA Pickleball Tournament brings the best of the best to our Hill Country backyard. We’re proud to host 15 collegiate golf teams for the second year in a row! The Kissing Tree Golf Club will be home to some of the most talented in golfers in the nation, and we can’t wait to make them feel right at home. Be sure to visit the Kissing Tree lifestyle calendar for daily and weekly events, and visit our Facebook page to stay up-to-date on the latest and greatest happenings!